This week media reports have detailed the Federal Government’s approval for significant clearing of Critically Endangered woodlands in the Hunter Valley and lack of oversight on potentially illegal broad-scale clearing in Cape York, permitted by the former Queensland Government in direct contravention of national environment law. The Federal Environment Department has just given mining company Coal and Allied the green light to clear 535 hectares of White Box-Yellow Box-Blakely’s Red Gum Grassy Woodland and Derived Native Grassland, a Critically Endangered ecological community listed under the Commonwealth Environment Protection and Biodiversity Conservation Act 1999 (EPBC Act). The community has been recognised as Critically Endangered since 2006, primarily due to a decline in geographic distribution, and since that time numerous developments have chipped away at what remains. Permitting a further 535 vital hectares to be cleared for a single project indicates the Government is loath to use its habitat protection powers effectively. “This is a unique and incredibly important ecosystem that has been absolutely smashed by development. More than 93% of the woodlands have been cleared since European settlement, yet the Commonwealth has justified the destruction of a further 535 hectares by requiring a biodiversity offset management plan and vegetation clearance protocols – simply inappropriate measures for Critically Endangered habitats,” said Humane Society International. 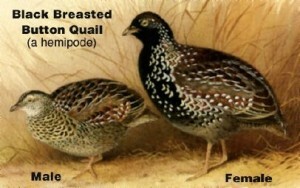 Similarly bad news has surfaced in Cape York, where clearing of 33,000 hectares of habitat for the buff-breasted button-quail (the only known Australian bird to have never been photographed in the wild) and at least 17 other threatened species listed under the EPBC Act was permitted in the dying days of the former Queensland Government. The EPBC Act is not meant to be used in this farcical way – Maryland Wilson Australian Wildlife Protection Council Inc.